The fall of 2018 saw the second annual Pandora Challenge: Music and Social Impact program at five universities across the United States. Participating students used Pandora’s Artist Marketing Platform (AMP) and data from Next Big Sound to harness the power of music, engage fans, support musicians, and launch Pandora Stories. At each university, a musical artist joined Real Industry and Pandora to bring awareness to a charitable organization of their choice through this challenge. We were honored to collaborate with Phora at the University of Miami, Jon Batiste at Carnegie Mellon University, Andrew McMahon at the University of Hartford, Bryce Vine at the University of Michigan, and the War On Drugs at New York University. On September 13, the program kicked off at University of Miami in partnership with chart-topping recording artist Phora. Participating students created a national music marketing and playlist campaign to support his social impact cause. The University of Miami Pandora Challenge wrapped up on October 9th! Congratulations to the winning team! In partnership with The Late Show with Stephen Colbert bandleader Jon Batiste, the next challenge was held at Carnegie Mellon University on September 17 in support of Sing For Hope and their mission to transform individuals and communities by leveraging the power of the arts to create a better world. The University of Hartford challenge was held on September 20 with singer-songwriter Andrew McMahon in support of the Dear Jack Foundation. This non-profit serves to fight against adolescent and young adult cancer. The University of Michigan Pandora Challenge took place on September 25 with breakout artist Bryce Vine and Barn Sanctuary in support of their mission to rescue, rehabilitate and care for farm animal refugees. 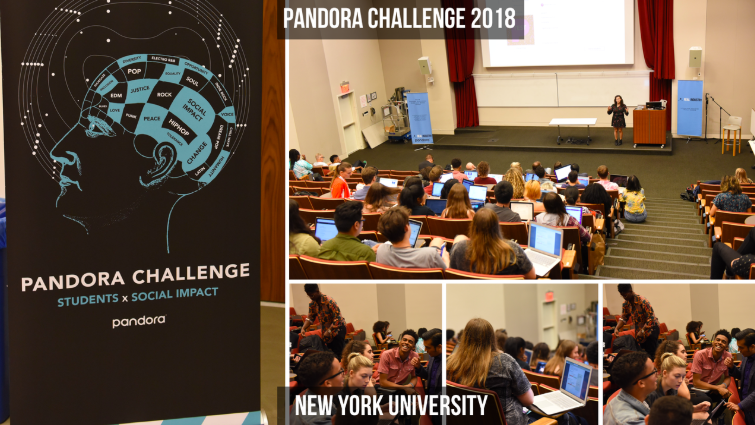 "We are so excited to host the Pandora Challenge at the University of Michigan. This challenge is an unprecedented opportunity to put our students inside a case study that showcases how high profile artists can actually cultivate social impact through their music,” said Jonathan Kuuskoski, Chair-- Department of Entrepreneurship and Leadership, Director-- EXCEL Lab, School of Theater, Music, and Dance, University of Michigan. “And the chance to work with rising star Bryce Vine to support a local organization like Barn Sanctuary is exactly the kind of experiential learning platform our students need as they develop their professional voices." At New York University on September 26, students in NYU Steinhardt’s Department of Music and Performing Arts Professions curated playlists, analyzed analytics, audience and fan engagement data, and worked with top industry mentors in partnership with musical artist The War on Drugs and the GRAMMY Music Education Coalition. Pandora has invested in helping artists connect with their fans at scale. The company introduced AMP in late 2014 and rolled out a full suite of self-serve marketing tools available to all artists on Pandora in 2016. In 2015, Pandora acquired Next Big Sound to help artists make insight-based decisions by aggregating data from across Pandora, social media, video platforms and other digital sources. To date, more than 15,000 artists are using AMP to make critical career decisions and more than 25,000 Artist Audio Messages have delivered over 1.8 billion impressions.